Read about Dr. Jamie Diament-Golub's sons & their humanitarian trips! My two children have been seeing Dr Jamie and her staff for years now after having transferred from another local dentist. Going to the dentist with my kids used to be a very stressful unpleasant experience and since we found Dr. Jamie's group , my kids actually LIKE going to the dentist! The staff is extremely accommodating and child friendly and their new office is totally modern with flat screens, a game room, a coffee bar and a very cool, huge salt water fish tank. They even have a patient appreciation party once a year that they invite us all to, just for fun! They are well deserving of 5 stars! Dear Dr. Jamie: We wanted to let you know that after 18 years of knowing you and going to your wonderful dental practice, we have finally (and reluctantly) all joined one adult dental practice together. Our preference would be that all four of us go to you...but that would be a little wierd! We wanted to personally thank you for all of your friendly, attentive and "above & beyond" service that you provided for Chloe & Austin over the years. We will never forget the time when we first moved to Montvale 15 yrs ago, Austin fell on his mouth and you offered to see him in your home if we had an emergency overnight before we could get to Fort Lee in the morning. Or when he more recently was hit in the jaw with a soccer ball and you and Dr. Auerbach saw him immediately that evening. And Chloe was so surprised when she had a tooth pulled and another young patient was having a rough first dental visit. You sent Chloe a gift certificate for ice cream and thanked her for being such a good sport. We wish you and all of your friendly staff continued success, and hope to see you around sometime soon. Jamie and Liz and all the staff were amazing with our son. Jamie and Liz only did necessary work that made sure he had good dental health. They use sound judgement to best treat your child. All the staff are super friendly and make the visit fun so your child will want to come back for their next visit. Dr Jamie & Dr Liz make going to the dentist a fun time for our children! As parents of a special needs child, my husband and I had much trouble finding the right pediatric dentist for our daughter. Fortunately, we heard about Dr. Jamie and her ability to relate to children with autism. Children with autism have very specific challenges in the dental office. Their office is exceptional at dealing with these challenges. Dr. Jamie and her team have a remarkable way of treating my daughter that makes going to the dentist absolutely painless for all of us! We highly recommend her. I was introduced to Dr. Jamie Diament-Golub when my son was only 2 by our pediatrician. She has been my kids' dentist for more than 20 years. My daughter had to reluctantly finally leave the practice when she moved away. I'll never forget how she won over my very anxious toddler son with her tooth raincoat. As a family consultant on summer experiences I am often asked for recommendations and Dr. Jamie and Liz are the only pediatric dentists I will refer. I absolutely have to make this post about my son's pediatric dentist group. I HAVE TO. Drs. 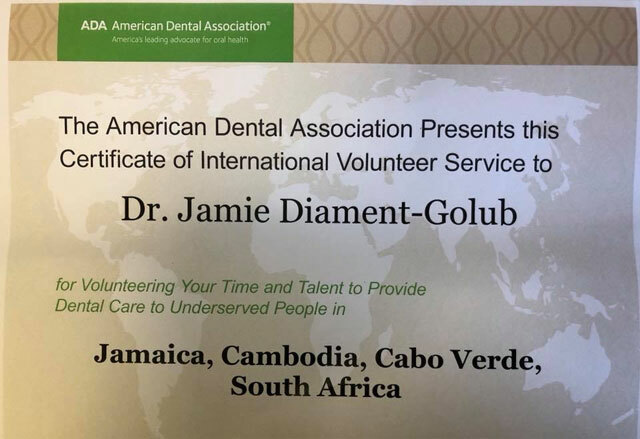 Jamie Diament-Golub and Liz Simon Pediatric Dentistry are just OUTSTANDING. You know you made the right choice from THE MINUTE you walk into their office. Remember dreading going to the dentist as a kid?? Ugh... NOT HERE. There's toys, TVs, games, prizes everywhere your child's eye can see. What do the adults see? A caring and attentive staff, up-to-date equipment, and approachable doctors...NOT TO MENTION that adorning their walls are pictures of the dentists your child is about to see visiting and caring for patients in impoverished countries. That's right, these docs PAY IT FORWARD! I don't know about you, but I like that; A LOT! They were HIGHLY recommended by my pediatrician. He was right. You want the BEST for your child?? Well, this is the place to go. Hey, when was the last time you heard this kind of praise for a dental group? Trust me.